Top quality products shipped direct from me in NZ so minimal postage costs and delays apply. Please note - not all products listed are guaranteed to be available. ​Click on the item for more information, and then contact me to discuss. 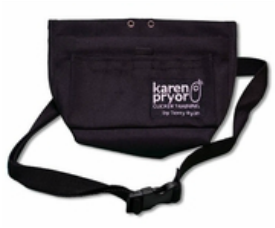 If I have none in stock, I can take your details and notify you when products are available. Hertha James is a horsewoman from Palmerston North who clicker trains, and competes at the highest levels of International Horse Agility. Her books can be purchased as e-books or hard copy (via Amazon). Hard copies also available from The Book Depository or Fishpond NZ. There are currently seven books in print, with another on the way! 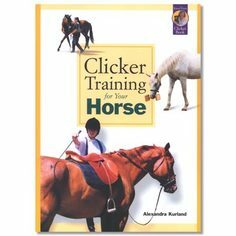 This book clearly outlines what is involved with clicker training horses. Positive reinforcement is explained and illustrated via links to free YouTube video clips. It contains eight detailed Training Plan outlines ready for use to set up education programs for individual horses. Techniques such as ‘free-shaping’ are clearly described without delving into scientific terminology. Positive reinforcement training of horses is beginning to challenge old ideas of how horse training is carried out. This book shows how equine clicker training opens up a host of new possibilities to teach horses by letting them know when they are right, rather than telling them when they are wrong. It shows how clicker training adds a new dimension to horsemanship. The handler and the horse learn the new clicker training language together. Clicker training does not mean clicking and treating everything the horse does forever. The book explains how it is a technique, to use along with other horse training techniques, to communicate more accurately what we would like the horse to do. It helps with the setting up of individual training plans that exactly suit the horse you have and what you would like him to learn next. A source book for everyone who spends time with horses. Whether you have horses for fun, competition, or as a profession, there is something in this book for you. Clearly written, without scientific jargon, this book helps us understand how our body language affects our horse. It explains how a horse’s perception of the world is different from our human perception because horses sense the world differently. This well-illustrated book is a treasure trove of information for every horse lover. Many horse and pony owners are realizing that a great deal of fun can be had by interacting with horses on the ground. For riders, the ground work creates a superb foundation for riding. For those who are no longer able to ride or have no desire to ride, and for people who love little ponies, this book is a gold mine of ideas to keep both horses and humans active, amused and learning new things. 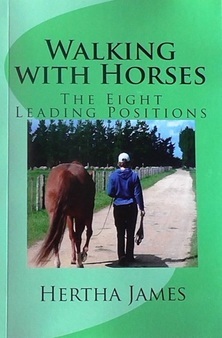 The term ‘leading positions’ refers to all the ways we orientate ourselves in relation to the horse in order to orchestrate where we would like him to put his feet. Becoming tuned in to the various leading positions enhances the conversations we can have with our horses. This book meshes nicely with the author’s previous two books: How to Begin Equine Clicker Training and Conversations with Horses. Both are available from Amazon. Each leading position is looked at in comprehensive detail. The book contains 20 Training Plans that can be adapted to suit individual horses, ponies, donkeys and mules. The concepts in the book are further illustrated with links to video clips that demonstrate the Training Plans in action. Walking with Horses includes background for training with positive reinforcement. It covers all the essentials to make our equine interactions safe and enjoyable for both parties. Walking with Horses is a fine addition to the ‘Life Skills for Horses’ series. Do you want to do something new with your horse but you're not sure how to start? Using examples, Hertha guides you from a vague training idea to a teaching and learning program that you custom-design for yourself and a particular horse. It is a process than everyone can learn. The approach is one of ‘constructing’ or creating the responses we want our horse to know so he can lead a safe, relaxed life in our care. This book shows us how to teach by focusing on what we can do together, not what we can't do yet. For everything we want to teach, there will be starting point where the handler and the horse can be successful together. A good Training Plan begins with a task clearly defined in terms of observable behaviour. The task is then broken down into parts small enough so that each part is in easy reach of the horse and handler's capabilities as they progress through their program. Hertha also shows how to incorporate clicker training (positive or reward reinforcement) into what we would like to do with our horses. This book is a superb addition to Hertha’s 'Life Skills for Horses' series. The Universal Horse Language program can be done alongside anything else you are already doing with your horse. Even if you are not interested in liberty work, it is a brilliant introduction to staying safe and having fun. Universal Horse Language guides you through a series of eight exercises done with the horse at liberty in a large roomy area. The exercises begin with quiet sharing of time and space. The last exercise can become a high energy frolic with your horse. Each exercise flows into the next one as the horse and handler get to know each other's body language. Body language is the first language of horses, so it makes sense for us to learn the natural body language of horses. Because horses already know these things, this book is about training handlers rather than training horses. Learning and using the Universal Horse Language exercises is a superb way to set 'dates' with a horse. Since all horses 'speak' the same language, we have a way of communicating with any horse. We can use it to begin a new relationship or strengthen an existing one. Once we learn it, we will never forget it. This book is another excellent addition to Hertha's 'Life Skills for Horses' series. Well-illustrated, this book presents ideas and tools to teach your horse about foot care in a way that allows him to retain relaxation and confidence. All the exercises are shaped with reward reinforcement (clicker training). The book starts with tasks that ensure we have the foundations skills on which to build confident foot care. It continues with exercises that enhance the horse's foot awareness and balance. Links to relevant YouTube video clips accompany the book. Horse foot care is an interesting topic because horses have understandable fear about their feet being compromised. At the same time, people have a natural fear about getting hurt if the horse gets upset. The purpose of this book is to enable relaxation and confidence at both ends of the lead rope. For a person new to horses, or a person dealing with a horse who has been traumatized with past foot handling procedures, this book packs a lot of useful information. ​This is the book I wished for when first faced with asking a horse to enter a trailer. Even if you have no trailer and don't travel to events with your horse, it's impossible to know what the future will bring. If injury, flood or fire mean your horse must travel, the foundation skills will be there. The book carefully describes how to check whether the handler and horse have the background skills needed for calm trailer loading. If the handler or horse are not yet fluent with these skills, the book provides details about how to teach and learn them using positive reinforcement. 99% of the skills can be learned using trailer simulations that you set up at home, so it is not necessary to have a trailer. 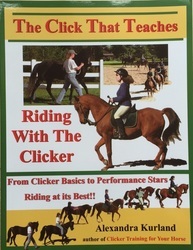 For readers not yet using equine clicker training, the book includes an excellent chapter on how to get started. Clicker training is also called the 'mark and reward' system. Used with people, it is called Training with Acoustic Guidance or TAG. A concise glossary helps clarify the few terms which may be confusing, but the book's language is clear and free of specialist jargon. 120 illustrations clarify the text. There are links to numerous free YouTube video clips that demonstrate the various skills and techniques. Many of the clips were especially made to accompany the book. A horse that steps into a truck or trailer willingly and with confidence demonstrates the thoughtfulness and time put into his training program.